Looking for beautiful beachfront hotels in Costa Rica with perfect views of the sand and the sea? Then our selection of great beachfront hotels may be just the thing for you. 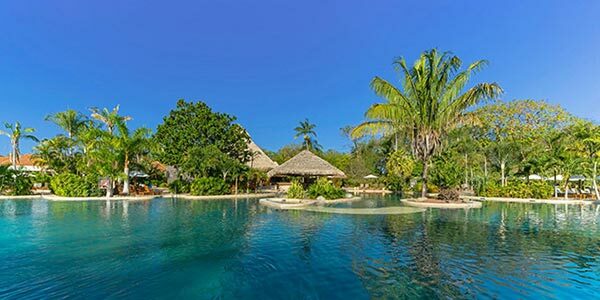 The tropical paradise of Playa Cativo in the wildlife-rich Osa Peninsula is a practically private, barefoot luxury experience ideal for nature lovers. Located along the Central Pacific, these beachfront villas feature unique, vibrant architecture and art and top-notch hospitality and amenities. Costa Rica has more than 300 beaches, lining up both the Caribbean and Pacific coasts, and the task of selecting just the right destination for your Costa Rican vacation can be more than daunting. Beachfront and kid-friendly? Five-star resort with exciting nightlife options or a secluded, boutique haven? Beachfront tree-house with a dense jungle behind it? Exclusive luxury? Charming bed and breakfast set right on the beach for the budget-conscious traveler? But need not worry, Costa Rica has it all! 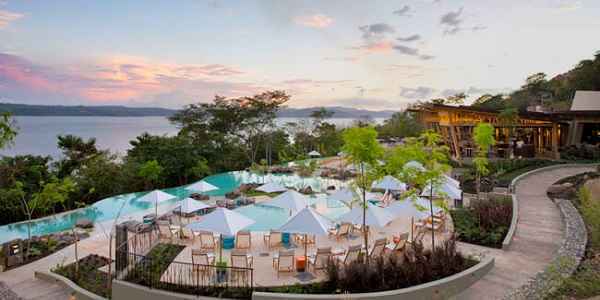 With 15 years of experience, and backed with our clients’ feedback, we developed a (somewhat short) list of Costa Rica’s beachfront hotels that clients absolutely enjoy and rave about. We are sharing it here, so your choice gets a little bit easier. Up on the north Pacific coast are the high-end five-star luxury resorts and somewhat more modest four-star options. Sprinkled along the numerous white-sand beaches, just a few of them actually offer an all-inclusive option. Anyone looking for nightlife should focus on choosing something in the Tamarindo area, while the exclusive beachfront luxury is reserved for Papagayo Bay’s Four Seasons resort. The Westin Conchal is optimal balance of beachfront, all-inclusive, kid-friendly resort with lots of activities on the plate for everyone, although it can feel a bit crowded during the high season. The remote Nicoya Peninsula is a surfing and yoga paradise. Dotted with eco-friendly boutique hotels and nature reserves, it is an ideal option for an escape from the daily grind. Featuring miles and miles of roaring brakes, secluded swimming holes and pristine turtle-nesting habitats, there’s no better place to disconnect and unwind. The Central Pacific coast boasts the famous Manuel Antonio area. If a beachfront is a must, then your best option is Arenas del Mar boutique hotel, equally suitable for both families and couples. The Southern Pacific coast, and especially the Osa Peninsula is an ultimate destination for nature enthusiasts, with Copa del Arbol as great a choice for couples and families wanting to explore nature wonders of the tropical jungle and still be just steps away from the beach. Email Us or call 1-800-606-1860 to find out which is best for you.